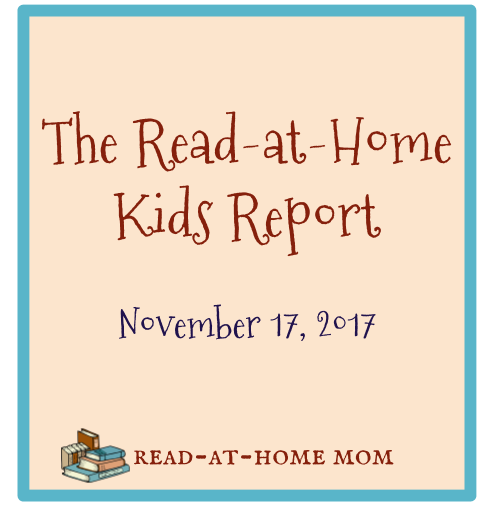 As promised when I posted my final edition of Reading with Little Miss Muffet and Little Bo Peep, here is my new and improved format for sharing what my kids are reading: The Read-at-Home Kids (RAHK) Report! I plan to treat this similarly to the Read-at-Home Mom report, posting on a weekly basis and focusing on what the girls are enjoying individually, as well as what I am reading aloud to them collectively. The RAHK Report will be published on Fridays, and I will link to the previous week's post in each Monday's RAHM Report. 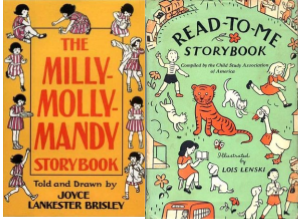 Our lunchtime read-alouds for the past few weeks have come from The Milly-Molly-Mandy Storybook and The Read-to-Me Storybook. Milly-Molly-Mandy has become a particular favorite of Little Miss Muffet, and Little Bo Peep loves to look at the pictures even if she is frequently eager for the reading to end quickly. I'm hoping to make a peg doll of Milly-Molly-Mandy for Miss Muffet either for her upcoming birthday or for Christmas. Independently, Miss Muffet has been reading the McGuffey readers for the past few months. Recently, she started the third reader, and she does one or two lessons a day. In addition to those lessons, she is also currently reading Frog and Toad All Year. When she finishes it, she will have read the entire series. She is also getting her first introduction to history through Munro Leaf's History Can Be Fun. There is no real expectation that she is retaining everything she reads, but she is picking up great vocabulary words: sculpture, architect, pyramid, papyrus, etc. Miss Muffet also asked me to start reading aloud from Find the Constellations by H.A. Rey. It was the author that caught her attention more than the subject matter, but ever since our trip to the planetarium this summer, she has been fascinated by space, so it was a great choice. 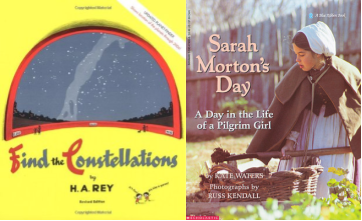 When her grandmother was visiting this past weekend, she also enjoyed hearing Sarah Morton's Day by Kate Waters. Bo Peep is starting to have a longer attention span for listening to picture books. She has been really into the Frances books by Russell Hoban this week, along with Owl Babies (which she read with Grandma during her visit), There's a Nightmare in My Closet, Can You Cuddle Like a Koala? and Clap Your Hands. When Miss Muffet first came home from the hospital, I used to read Narnia books aloud to her. Since I've been meaning to finish the series, I have been sporadically reading to Jumping Joan from The Silver Chair, but we are often interrupted by a need to sleep, or eat, or have a new diaper, so it's slow-going. The big girls have been showing her Black and White and a couple of the Sassy titles, but she's mostly still too little to appreciate them. She gets her daily dose of early literacy from nursery rhymes that I recite from memory, and singing, which we do randomly throughout the day.